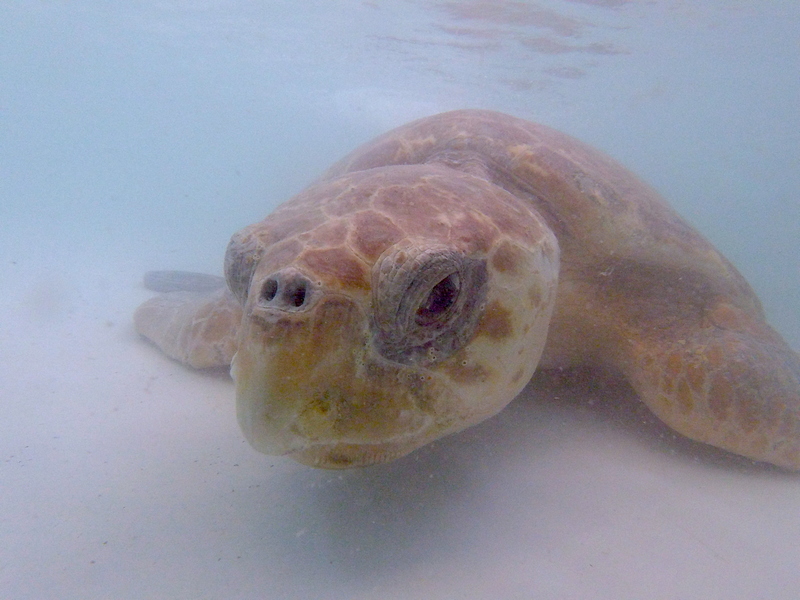 Adult male loggerheads can reach about three feet in shell length and weigh about 250 pounds, but larger individuals of more than 1,000 pounds have been documented. From May to October, they arrive in Gulf waters to mate with nesting females. This adult male was observed from the beach struggling in the water and rolling over onto its back. It was rescued by the SCCF Turtle Research team and transported to the CROW Clinic. 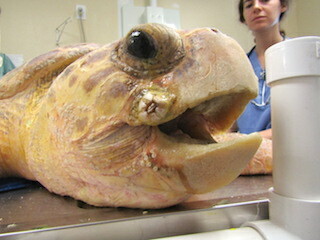 During the turtles intake exam, there were no apparent injuries. Veterinarians suspect the turtle is suffering from brevetoxicosis, or red tide poisoning. Blood samples were taken to confirm the diagnosis. The turtle weighed in at 107 kg (about 237 pounds)! 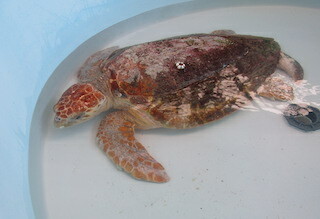 After being 'dry-docked' for the first 24 hours, the male loggerhead was placed in a shallow tank of freshwater. He began moving around as the water was filling. 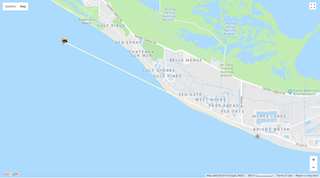 After spending 36 hours in freshwater, the turtle was transitioned to deeper, brackish water and the salinity was slowly increased to match the ocean. The turtle was reported to have had a successful bowel movement over the weekend, but has not had a strong appetite since arriving at the clinic. 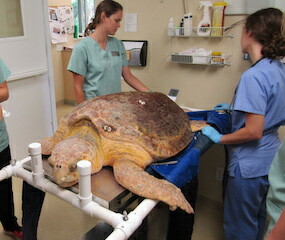 Rehabilitation staff has reported that the male loggerhead turtle began eating when offered food yesterday afternoon. Today, they say his appetite has increased even more. The male loggerhead turtle was featured in the week's edition of the Island Sun Newspaper as CROW's Case of the Week. You can read the article by visiting our homepage and scrolling down to "Press Releases"! 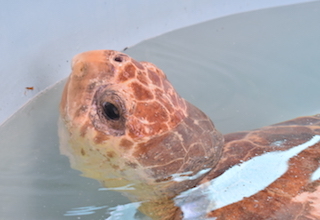 The adult male loggerhead has been cleared for release. In partnership with Mote Marine Lab and Sea Turtle Conservancy, the turtle will be satellite tagged. 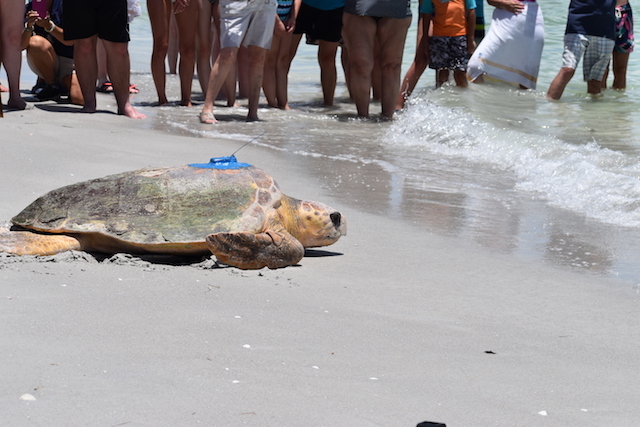 This will allow researchers to track his movements and compare to other male loggerheads. As part of the program, the turtle was named "Walter" in honor of CROW's 50th Anniversary and its founder Shirley J. Walter. Once Walter has been tagged and released, the link to follow his movements will be posted on our homepage and social media channels. Walter has been successfully returned to the Gulf of Mexico. Visit our homepage to read more about the satellite tag. We will continue to provide updates about Walter's whereabouts as the information comes in! 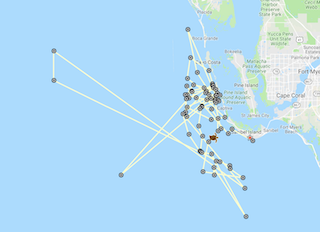 Walter's transmitter is working and it shows he was offshore of Bowman's Beach! Cumulative distance traveled: 7 km (4 miles) Distance covered since last location: 6.71 km (4.17 miles) Average speed since release: 0.28 kph (0.17 mph) Average speed since last location: 0.28 kph (0.17 mph) Time since last location update: 15 hours Time tracked: 1 days Data and map © STC. Walter continues to move northward. 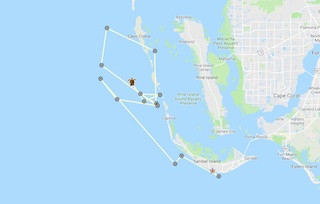 He is now offshore of Cayo Costa Island. Cumulative distance traveled: 130 km (81 miles) Distance covered since last location: 7.58 km (4.71 miles) Average speed since release: 0.77 kph (0.48 mph) Average speed since last location: 0.34 kph (0.21 mph) Time since last location update: 12 hours Time tracked: 7 days Data and map © STC. 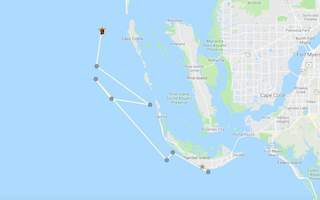 Walter has been tracked offshore of South Seas Resort on the north end of Captiva Island. He has been hanging around this area for the last few days. Cumulative distance traveled: 167 km (104 miles) Distance covered since last location: 4.66 km (2.89 miles) Average speed since release: 0.53 kph (0.33 mph) Average speed since last location: 0.20 kph (0.12 mph) Time since last location update: 12 hours Time tracked: 13 days Data and map © STC. 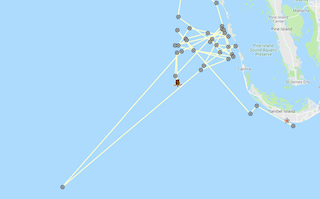 Walter took a little adventure out to sea this week before returning back to the area offshore of Cayo Costa he has been hanging out. Cumulative distance traveled: 302 km (187 miles) Distance covered since last location: 37.20 km (23.12 miles) Average speed since release: 0.46 kph (0.29 mph) Average speed since last location: 1.47 kph (0.91 mph) Time since last location update: 8 hours Time tracked: 27 days Data and map © STC. 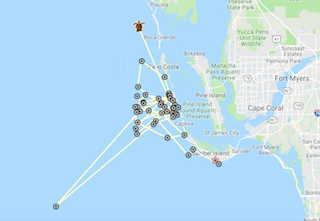 Walter continues to cruise around off-shore of Cayo Costa island. Cumulative distance traveled: 352 km (219 miles) Distance covered since last location: 6.41 km (3.98 miles) Average speed since release: 0.44 kph (0.27 mph) Average speed since last location: 0.27 kph (0.17 mph) Time since last location update: 15 hours Time tracked: 33 days Data and map © STC. Walter's most recent location shows him heading north. He is now north of Boca Grande. Cumulative distance traveled: 428 km (266 miles) Distance covered since last location: 25.92 km (16.11 miles) Average speed since release: 0.43 kph (0.27 mph) Average speed since last location: 1.04 kph (0.65 mph) Time since last location update: 11 hours Time tracked: 41 days Data and map © STC. Walter has been tracked heading south over the last few days, the furthest south he has stayed since his release. Cumulative distance traveled: 500 km (311 miles) Distance covered since last location: 3.60 km (2.24 miles) Average speed since release: 0.39 kph (0.24 mph) Average speed since last location: 0.15 kph (0.09 mph) Time since last location update: 16 hours Time tracked: 53 days Data and map © STC. 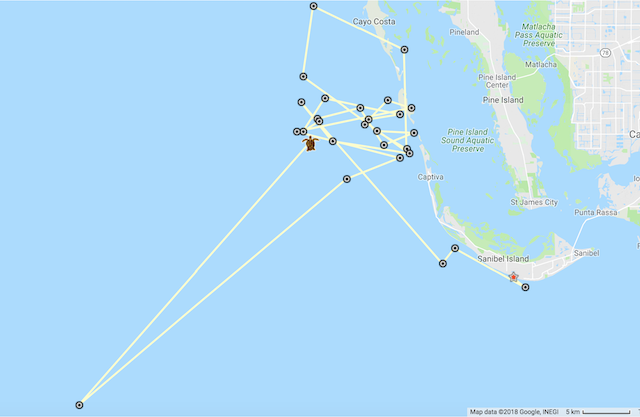 The researchers conducting the study on male sea turtle movements say it has been nearly a week since the last transmission from Walter's satellite tag came in on September 8. 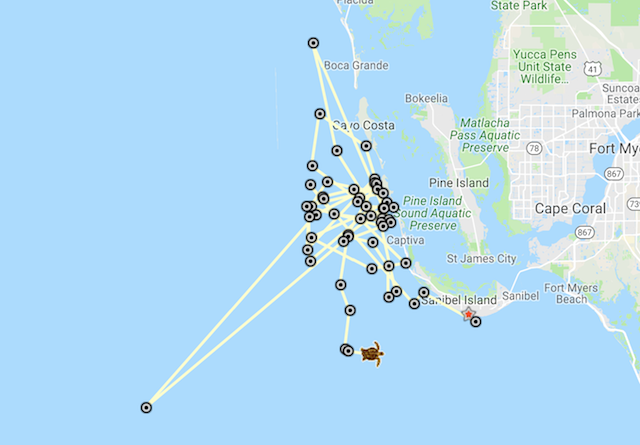 According to the Sea Turtle Conservancy's site, "Not receiving points could be due to many factors: the transmitter is not working for some reason, the transmitter has fallen off, the transmitter antenna has broken off, or the batteries that power the transmitter no longer work. Ideally, the batteries in these transmitters can last for 8-10 months, but signals often stop prematurely. Ideas about why this is occurring range from problems with salt water getting into the device to turtles knocking the devices off as they wedge themselves under rocks. There have been examples of transmitters lasting no longer than a few days or weeks, but also examples of transmitters lasting for more than a year." Here is the most recent map of Walter's movements. We certainly hope he stays safe out there!